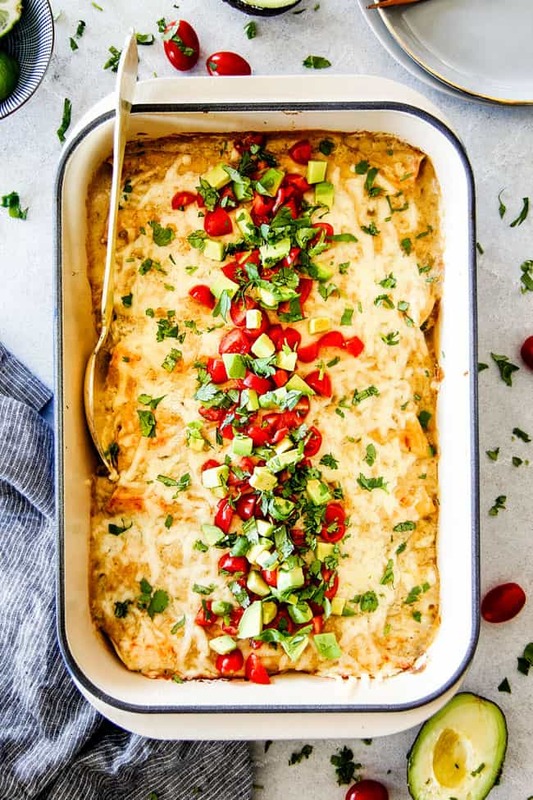 These Green Chile Chicken Enchiladas are easy to make, satisfyingly rich, cheesy, creamy and saucy – no dry chicken enchiladas here! – with flavor exploding homemade green chile sour cream sauce (no cream soup)! 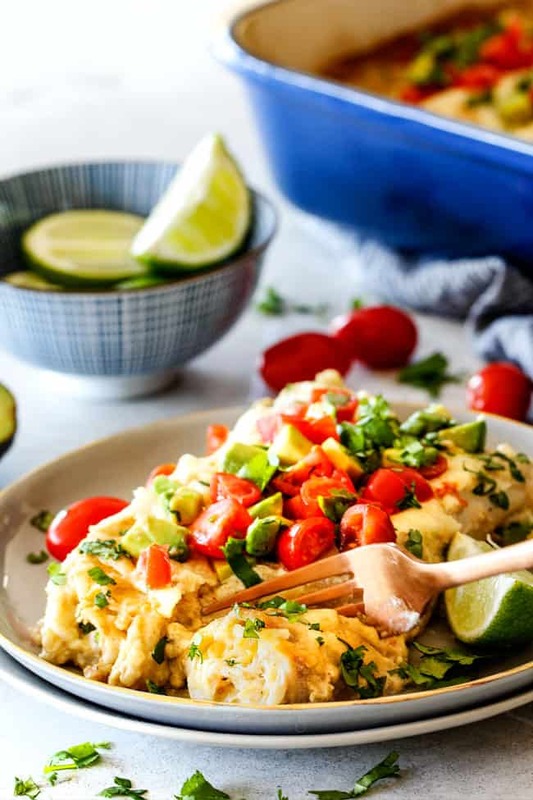 These Creamy Green Chile Chicken Enchiladas come together in a snap with the use of juicy rotisserie chicken, store bought green chiles and salsa verde sauce. They can be made ahead of time and refrigerated for an easy make-ahead dinner! 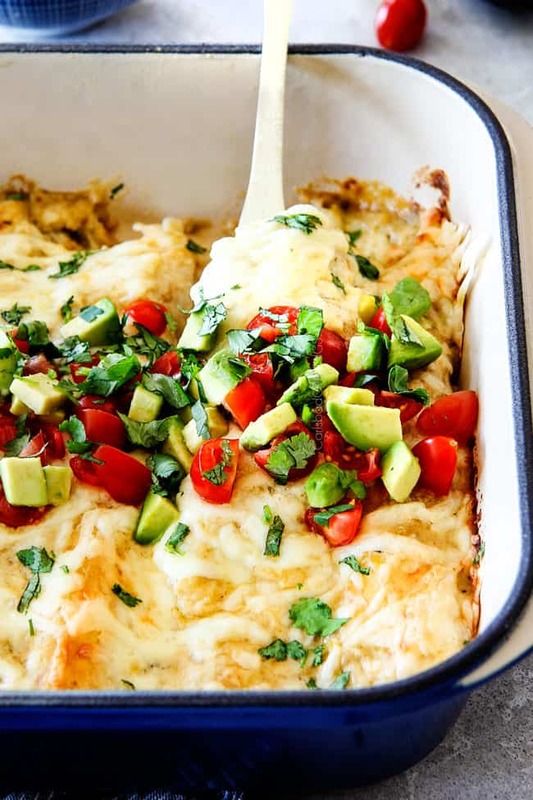 If you have never had White Green Chile Chicken Enchiladas before, stop the insanity now! 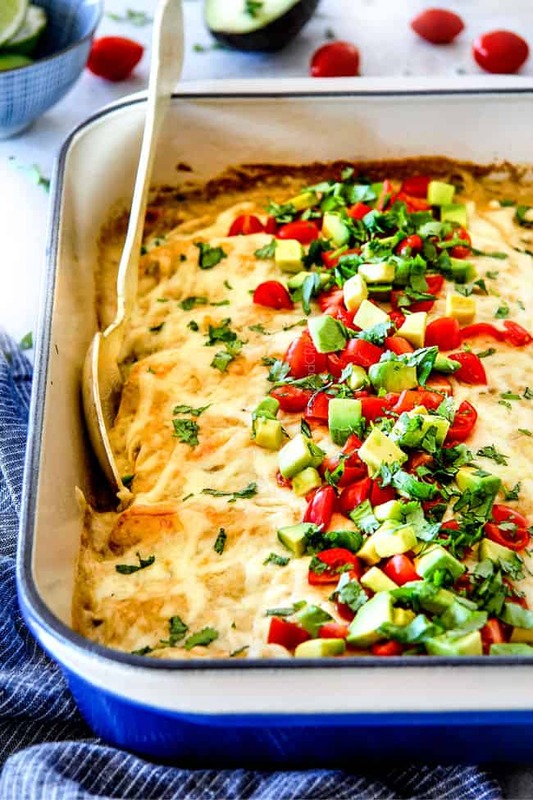 These Creamy Green Chile Chicken Enchiladas are a crazy delicious cross between your favorite Sour Cream Chicken Enchiladas AKA White Chicken Enchiladas and Salsa Verde Chicken Enchiladas. I honestly didn’t know what to call them because no name seemed to do them justice. In the end, I called them Creamy Green Chile Chicken Enchiladas. But you can just call them the best chicken enchiladas of. your. life. They are so good in fact, I took these photos in less than 10 minutes because Patrick was by my side, chomping at the bit ready to dig into this cheesy goodness. I am a huge chicken enchilada lover. From my crazy popular Salsa Verde Honey Lime Chicken Enchiladas which are sweet and tangy to my Jalapeno Chicken Enchiladas which are cheesy and spicy, to my Barbacoa Beef Enchiladas which are tangy, cheesy and spicy to my Breakfast Ham and Cheese Enchiladas with are saucy and cheesy, to these Creamy Green Chile Chicken Enchiladas! It is super hard to pick a favorite, but you guys, these might just be them. I am obsessed. I could eat half the pan by myself. I have absolutely no self control when it comes to their creamy flavor exploding goodness. 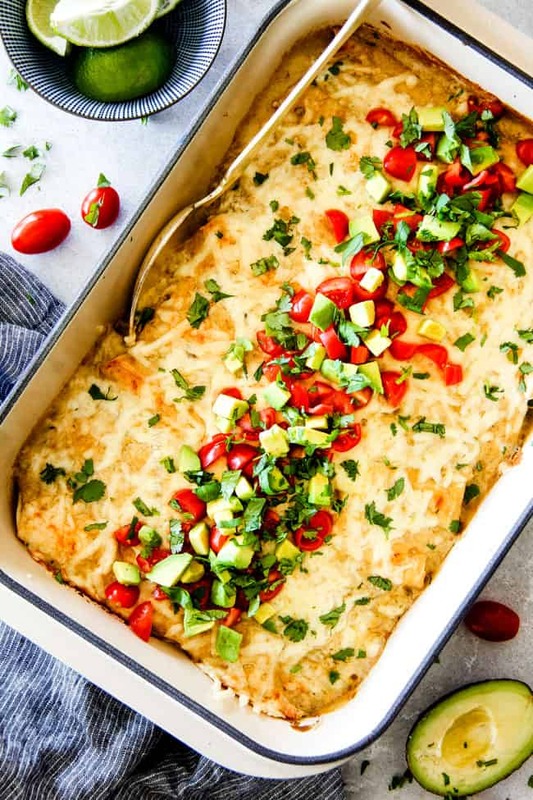 These “White” Green Chile Chicken Enchiladas are inspired by a favorite chicken enchilada casserole my mom used to make growing up. It was a base of cream of chicken soup mixed with milk, sour cream and green chiles. I’ve kept the creaminess of the original with a perfected homemade cheesy, creamy white sauce infused with green chiles and salsa verde that takes them over the top. Many Sour Cream Chicken Enchilada Recipes or White Chicken Enchilada recipes rely on one can of green chiles for the flavor but I found that when I combined the homemade white sauce with both green chiles AND salsa verde, we achieve a flavorful tang that cuts through the creaminess with tons of flavor AKA pure Mexican comfort food at its most obsessive worthy. I’ve tried to make these White Green Chile Chicken Enchiladas as simple as possible with both my methods and ingredients so they come together super quickly. 1. Green Chile Sour Cream Sauce: We start by melting butter in olive oil over medium heat in a large saucepan then sauteing our onions for 3 minutes. If you are feeling lazy, like I often am, then you can substitute the onion with 1 teaspoon onion powder. Just add it with the rest of the spices. 2. Next, sprinkle in some flour and garlic and cook for 2 minutes (it will be thick) to get rid of the raw flour smell. Reduce heat to low and slowly whisk in chicken broth, followed by salsa verde, green chiles, chicken bouillon, ground cumin, salt and cayenne pepper. I find the 1/2 teaspoon cayenne pepper has a mild kick but not overly spicy. If you aren’t sure how much you want to add, then simply add a little, stir, taste and add more if desired. You can always add some hot sauce to your enchiladas after they are cooked. 3. Bring your sauce to a boil then reduce to a simmer until thickened. Stir in your luscious sour cream and watch the sauce change from green to creamy white before your eyes. 4. Filling: This is the easiest part! 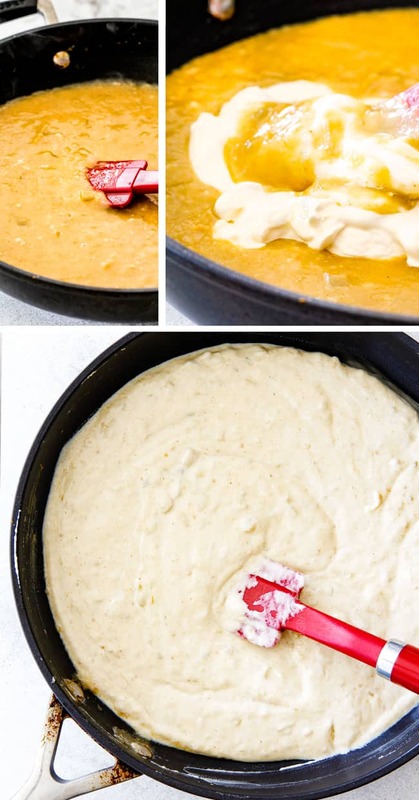 I use our Green Chile Sour Cream Sauce as both the enveloping sauce and to creamify the filling so we don’t have any double work or ingredients. Simply add 1 cup of your Green Chile Sour Cream Sauce to your chicken along with 2 cups cheese, and mix together. 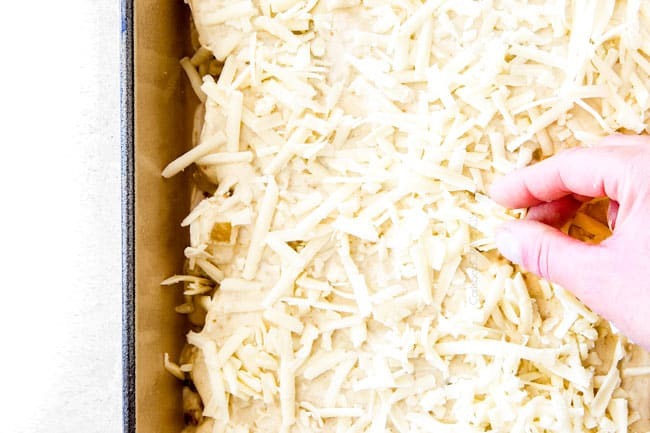 I also like adding the cheese directly to the filling so we don’t have the extra step of layering each individual tortilla – and to be honest, getting the cheese evenly divided kind of stresses me out – anyone else? 5. 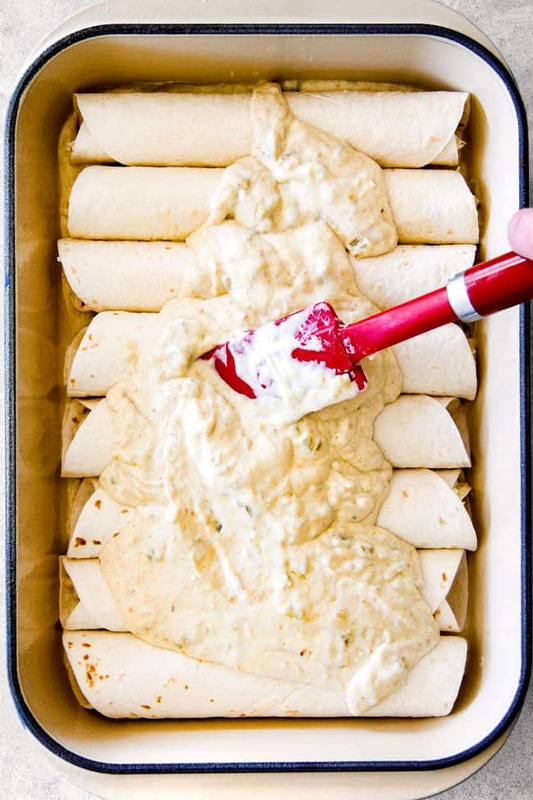 Assemble and Bake: Spread approximately 1/2 cup Green Chile Sour Cream Sauce on the bottom of a lightly greased 9×13 baking dish (layer will be very thin). Add the enchilada filling to the center of each tortilla (approx. ½ cup), roll them up tightly and line them in the dish. 6. Top enchiladas evenly with remaining Green Chile Sour Cream Sauce followed by remaining cheese and bake for 30 minutes to golden bubbly deliciousness! What Should I Serve with Chicken Enchiladas? Take care to buy the canned MILD chopped green chiles. I have mistakenly bought the hot green chilies before and they are HOT! Mild green chiles on the other hand are tangy but not spicy. Take care to purchase MILD salsa verde unless you know you are a spicy fanatic. I like to purchase the mild salsa verde because then you can customize the heat with the addition of cayenne pepper to taste. It is easy to add heat but it is hard to take it away when it comes pre-packaged! To make these White Green Chile Chicken Enchiladas come together in a snap, use rotisserie chicken. 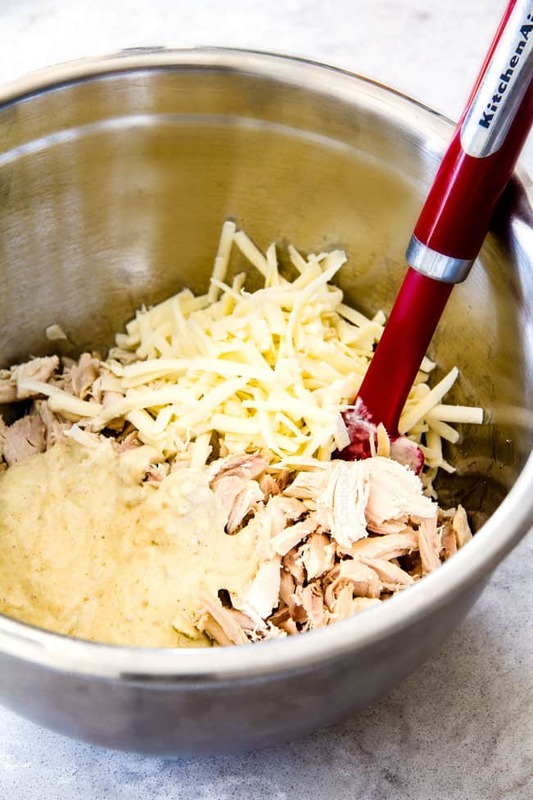 If don’t have time or don’t want to, then it is easy to make your own shredded chicken – I’ve included instructions below this section. You can use flour or corn tortillas, but I find corn tortillas fall apart more easily. To prevent this, you can flash fry and dip in some salsa verde post (you can see exactly how to do this in my Enchiladas Verdes recipe). 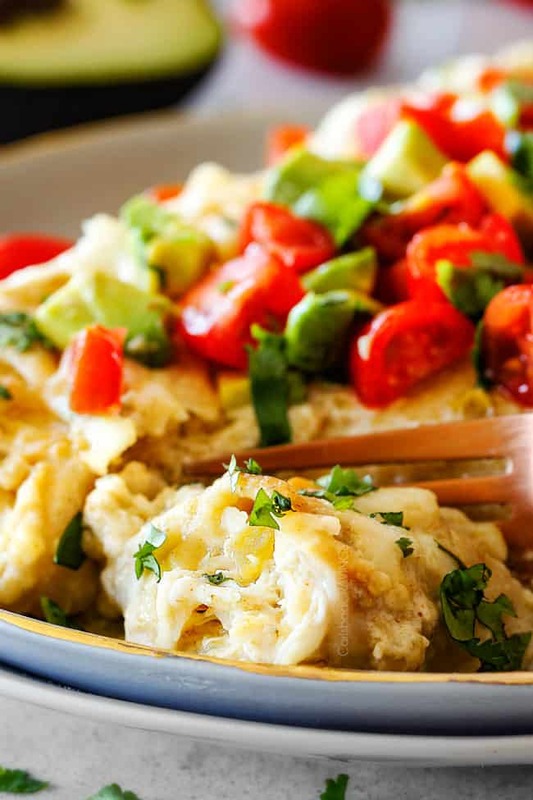 Alternatively, you can make an Enchilada Casserole by layering the creamy chicken mixture with cut up corn tortillas, this way you don’t have to worry about them falling apart. If you’re not using a rotisserie chicken, it is easy to make your own shredded chicken! Add 1 pound chicken breasts pounded thin (2-3 breasts) and cook 3-5 minutes, or until golden brown on one side. Remove chicken from skillet and let rest 5 minutes before shredding (or dicing if preferred). substitute Greek yogurt for the sour cream – this is totally personal preference. I prefer sour cream but if you love Greek yogurt, it is a good healthier alternative. It is a 1:1 substitute. add as little or as much cayenne pepper to taste. I find the 1/2 teaspoon listed has a mild kick but not overly spicy and should be the right heat for most people unless you are super sensitive to heat. 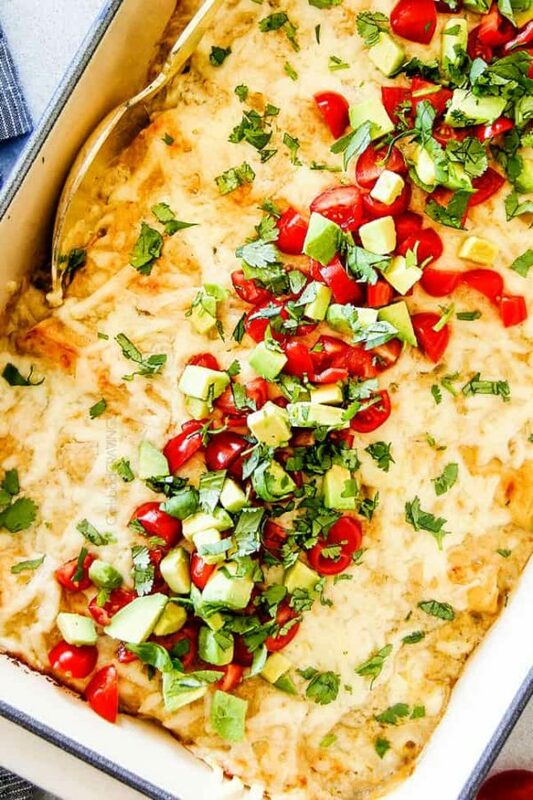 Yes, you can make these Green Chile Chicken Enchiladas ahead of time for an easy dinner! 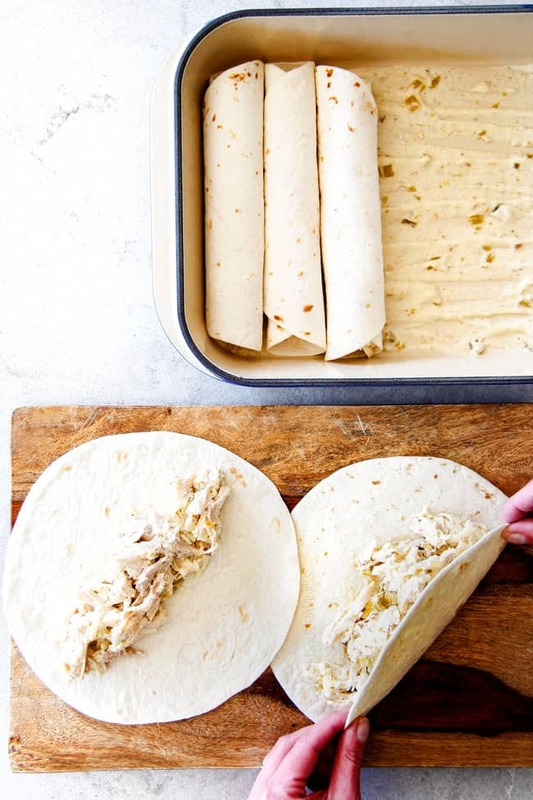 Simply prepare enchiladas according to directions, cover tightly with plastic wrap or foil and refrigerate for up to 24 hours. You take them straight from the refrigerator to the oven and increase the baking time by approximately 10 minutes or until they are hot and bubbly and completely heated through. How Long are Enchiladas Good For? Chicken Enchiladas should be covered tightly in plastic wrap or foil or stored in airtight container in the refrigerator. When stored correctly, enchiladas are good for about 5 days. Of course, always use your best judgment and if anything smells off, then toss them. We are usually just reheating a serving of the enchiladas and not the entire pan, so we typically reheat them in the microwave. If you are using the oven, then cover the pan with foil and reheat at 250 degrees F until heated through. Can I freeze Green Chicken Enchiladas? While some enchilada recipes freeze well, I do not recommend freezing these Creamy Green Chile Chicken Enchiladas if you are picky about texture. The tortillas soften further and the texture of the sauce changes due to the dairy. If you aren’t too picky though, then go for it! Now sit back and enjoy your new favorite Green Chile Chicken Enchiladas! If you love these Green Chile Chicken Enchiladas, then you will love my Salsa Verde Chicken, Smothered Baked Chicken Burritos, Slow Cooker Mexican Chicken, Skillet Chicken Fajitas, and Southwest Chicken Egg Rolls! 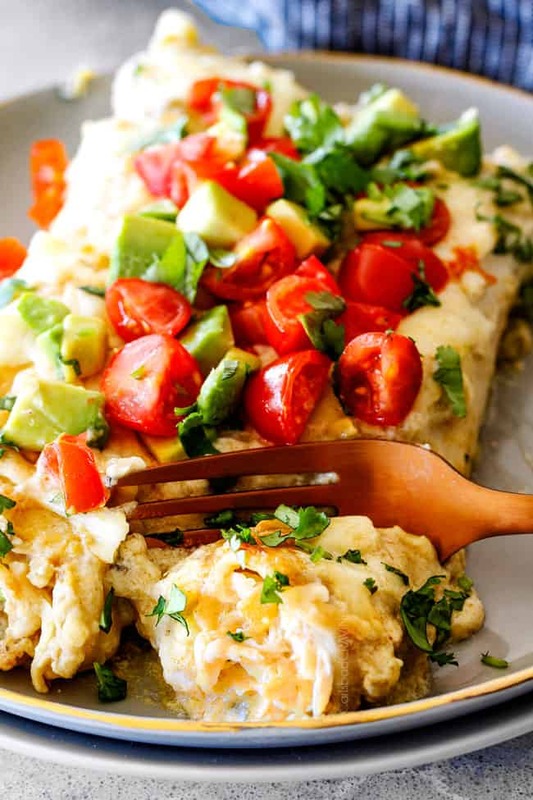 Want to try this Green Chile Chicken Enchiladas Recipe? 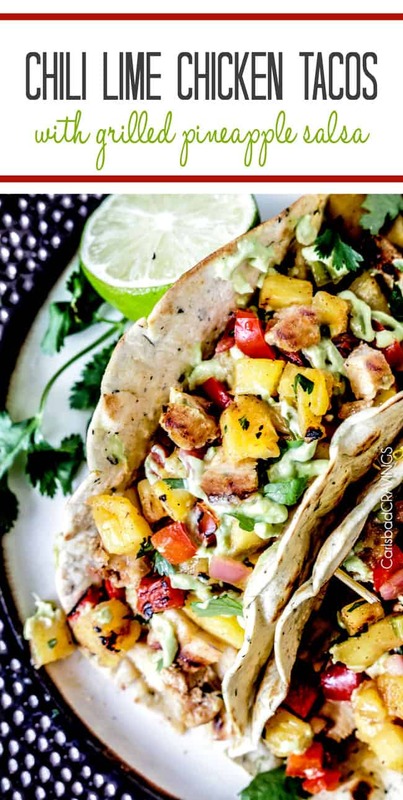 Pin them to your CHICKEN, DINNER, or MEXICAN Board to save for later! These Green Chile Chicken Enchiladas are easy to make, satisfyingly rich, cheesy, creamy and saucy - no dry chicken enchiladas here! - with flavor exploding homemade green chile sour cream white sauce (no cream soup)! These Chicken Enchiladas come together in a snap with the use of juicy rotisserie chicken, store bought green chiles and salsa verde sauce. They can be made ahead of time and refrigerated for an easy make-ahead dinner. Melt butter in olive oil over medium heat in a large saucepan. Add onion and sauté 3 minutes. Sprinkle in flour and garlic and cook for 2 minutes (it will be thick). Reduce heat to low and slowly whisk in chicken broth, followed by salsa verde, green chilies, chicken bouillon and spices. Bring to a boil then reduce to a simmer until thickened. Remove from heat and stir sour cream. Add chicken to a large bowl. Stir in 1 cup Green Chile Sour Cream Sauce and 2 cups cheese. Spread 1/2 cup Green Chile Sour Cream Sauce on the bottom of a lightly greased 9x13 baking dish (layer will be very thin). Add the enchilada filling to the center of each tortilla (approx. ½ cup), roll them up tightly and line them in the dish seam side down. Top enchiladas evenly with remaining Green Chile Sour Cream Sauce followed by remaining cheese. Bake uncovered at 350 degrees F for 30-35 minutes or until cheese is completely melted and center is hot. Broil until cheese is golden (optional). Top or serve with desired garnishes. *You can make your enchiladas as saucy or less saucy as you like - simply use more or less of the Green Chile Sour Cream Sauce. 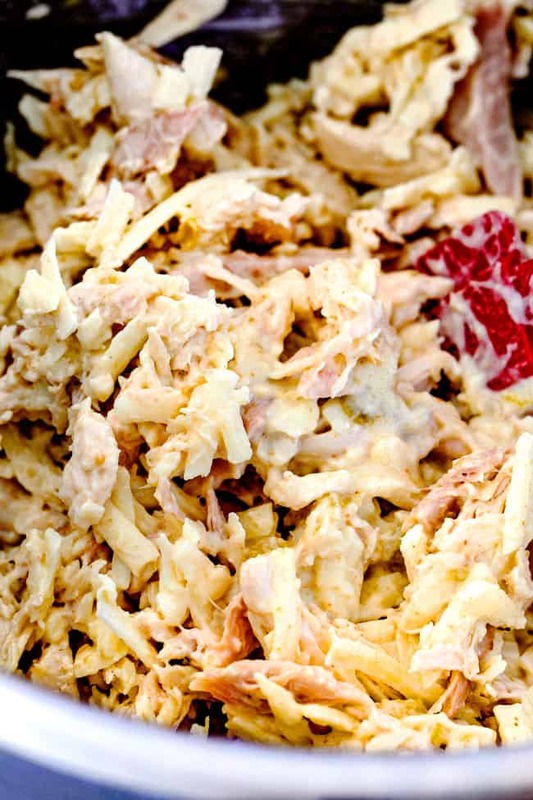 **If you’re not using a rotisserie chicken, it is easy to make your own shredded chicken! Add 1 pound chicken breasts pounded thin (2-3 breasts) and cook 3-5 minutes, or until golden brown on one side. Flip chicken and add 1 1/2 cups chicken broth. Cover and reduce heat to medium and simmer 10 minutes, then flip chicken over and continue to cook 5-10 minutes or until chicken is cooked though and tender enough to shred. **I don’t find these enchiladas very spicy but they do have a mild kick. Feel free to omit or reduce the cayenne pepper if you want them very kid friendly or you are sensitive to heat. Honestly, this must be best site on the internet for Mexican and Asian food. I decided to get up the morning and do some painting. Instead I opened by email and saw another one of your postings. I am so impressed with all the explanations you give about some of the ingredients in your recipes. Your photos break down the process or we can skip to the recipe. I can’t imagine how much time a posting takes you. Thank you so much for your efforts in creating such a lovely site. I hope to make this soon. Still trying to catch up on making recipes from your other postings. You are the sweetest Allie! Your comment was like a big internet hug! I SO appreciate that you appreciate my site and the time I put into it. I want every recipe and posts to be the best it can be so people love the recipe results! Thank you for taking the time to make my day! I hope you love these chicken enchiladas! 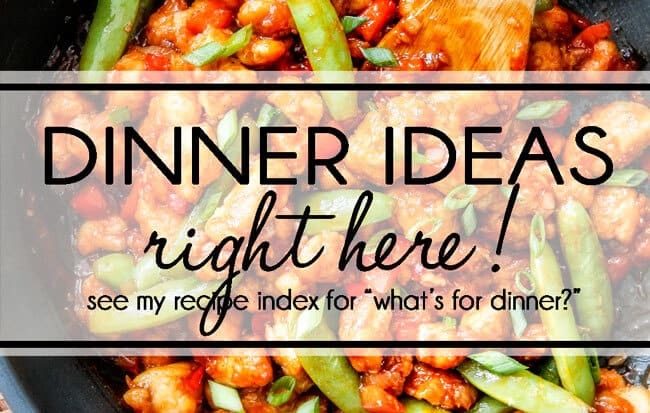 I have to agree with Allie….Jen your recipes are some of the best I have seen on the internet. From scratch, quality ingredients and authentic. Finally someone who has created beautifully delicious meals that could be from famous high end restaurant chefs. I love how you take the time to explain the process and have gone the extra mile to make it so authentic. I consider myself a huge foody and have a passion for food quality meals and recipes…I have practiced and studied cooking from a very young age and thought I knew a lot but I have gained so much knowledge from you. You are now my most favourite food person/recipe blog. I just love you! Love seeing these enchiladas. I’m not a fan of tomato type sauces so this is right up my alley. I know what we’re having for dinner tomorrow night. Awesome! I am so excited for you to make them! Made these enchiladas tonight. Hubby and I loved them! The only change I made was I added 4 oz of low fat cream cheese because I forgot to buy sour cream. They were really great. I have never made chicken enchiladas but will be making these again! Thanks for your great posts. I am going to make the shredded beef recipe that you posted recently next! Thank you so much for taking the time to comment Marjorie, I’m so happy you and your husband both loved them! I’m so glad the cream cheese substitute worked well too – you can’t go wrong with cream cheese! I hope you love the shredded beef too! I have a moment to remember all the awesome Carlsbad Cravings recipes I’ve tried. “This one is really good. I like this” Jesse said. So basically this is the BEST. loved how creamy it was! He doesn’t sound like a very effusive critic – LOL! I’m happy that means he liked them! YAY! I’m thrilled they were a hit just exactly as written – that is awesome! Thanks so much Lisa!!! Unbelievably delicious, I made my own shredded chicken (legs and thighs) and then used that liquid to make my own chicken broth. The sauce had so much depth of flavor, I had a can of green chilies that was 7oz. instead of 4 otherwise I did mostly follow the recipe. I served it with authentic refried beans and a Spanish rice I made. I will make this often, thank you so much for the recipe! Your comment made my day because this is one of my favorite recipes so I love hearing YOU loved it! Thank you so much! And your whole meal sounds fantastic! Amazing recipe! I made a batch yesterday to celebrate Cinco de Mayo today but we ate them last night! We like our enchiladas moist so I saved some of the sauce and poured it on top the last 5 minutes it baked. It was delicious! The only slight change I made was adding 2 tbsp. of low fat cream cheese and it made the sauce even creamier. We enjoy spicy food and this was just right. Thank you for another great recipe. Happy Cinco de Mayo! I’m thrilled you loved this recipe so much they didn’t even last until today! The addition of cream cheese sounds fabulous!!! Happy Cinco de Mayo to you too! These were delicious! Any suggestions on reheating them? Would the oven work better than the microwave to keep them from getting soggy like these type of leftovers sometimes do? I’m so happy you liked them Leanne! Unfortunately, I think enchilada leftovers have a tendency to get soggy no matter how you reheat them. If you toast the tortillas before you roll the filling initially then they reheat better. Yet another 5-Star recipe. These are so, so good. I also would like to use the sauce as a soup, it’s delicious! You so consistently provide us with fantastic recipes; thank you! Thank you so much Ali and I love how you customized it with all those yummy fillings! And your husbands request says it all – LOL! Hi Jen! I made these Sunday night and we all loved them, even my hubs who claims he doesn’t like salsa verde My question is if I were to make this in a layered casserole form with corn tortillas, how would you suggest layering? We always have leftovers and the flour tortillas just didn’t hold up well when reheated. Hi Misty, I think the easiest way would be to make the enchilada sauce and reserve 1/3 cup for the top. Mix in the chicken and 2 cups cheese to the rest of the sauce. Layer the saucy chicken mixture with tortillas until it is gone then layer with a final layer of tortillas then top with reserved sauce and cheese. I hope that helps. Enjoy! Hi Jen, this one was a hit! Thank you. I am celiac so used corn tortillas and GF flour, they came out great (also used jar of trader joes salsa verde instead of herdez). Kids and husband are tough critics and these went down the hatch in no time. Greetings all the way from east coast! Wahoo, thanks Nancy! I’m so pleased they were such a hit with the food critics and you were able to make them GF!